Eleanor Ray, Wyoming Window, June, 2018, oil on panel, 6 1/2 x 8". 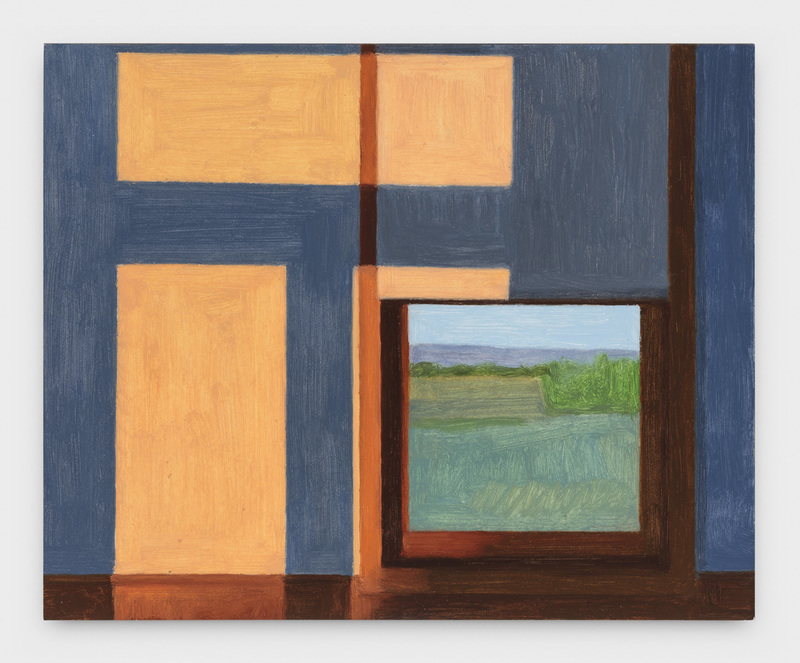 The painting I describe, Marfa Window, 2017, is one in a group of works by Eleanor Ray. I stand close enough to her small panels that the images break down, becoming a series of soft geometric forms. The compositions have the tightness of photographs, and the light is plein air. Art and earth play shadow games. A window frame—from which we can see arid lands in places such as Utah and Wyoming—is depicted from different angles and distances across several pieces, so that the vantages onto the landscapes also shift. The longest wall in the gallery is hung with five paintings of Robert Smithson’s Spiral Jetty, 1970. On the opposite wall hangs a sixth representation of the renowned work of Land art; here the perspective is so low that the curves flatten into a line. Another painting, Galisteo (Agnes Martin), 2018, is a rendering of the titular artist’s house in New Mexico. The insertion of this painting provides a reason for the show’s palette of desert hues: oranges, blues, mauves. Brush marks give texture to the brush. I keep returning to Wyoming Window, June, 2018. Three golden rectangles float on the interior wall of a house—a glow thrown from a portal behind the painter as she captures a memory of dusk.